If you like the color blue, consider blue flowering plants for your garden. The color itself is soothing to look at and predominantly blue plantings can have a quite striking effect by themselves or when combined with contrasting white or yellow flowers. True blue flowers are difficult to find as most will tend to the purple or lilac shades, even when promised as blue. 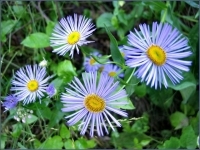 Aster - sky blue aster is a perennial wildflower common to the Northern US and blooms from August through October. Cornflower - also known as bacherlor's button is an annual, easily grown from seed and will thrive most anywhere. Delphinium - many truly blue cultivars of these stately perennials are available. Some grow to heights over 8 feet tall, making them perfect for background plantings. Flax - linum perenne, commonly known as blue flax is a perennial wildflower with lovely sky blue flowers that blooms on and off from spring through summer. Forgetmenot - this little gem is a herbaceous annual, biannual or perennial that will come back year after year and also seed itself. Grape Hyacinth - one of the earliest blooms of the season. This is a small spring flowering bulb which multiplies with abandon under the right conditions. Beautiful when planted in drifts with hyacinths. Hydrangea - a spreading shrub that can attain considerable size and will tolerate some shade. Hydrangea macrophylla has a lovely sky blue color. Iris - iris are perennials and come in all sizes from 6 inches to over three feet tall. By carefully selecting plants, you can have flowers from spring to late summer. Larkspur - easily grown from seed, they prefer cool climates and partial shade. Mature plants can be propagated by division of the rhizomes. Violet - another perennial that blooms in spring. Many truly blue hybrids are available at plant nurseries. Virginia Bluebells - early spring woodland plant with sky blue flowers. Bluebells like a moist environment and are easily naturalized in the proper setting. There are many more blue flowering plants and shrubs available. Take some time to visit your local garden center or online plant shops. With a little planning, you can have blue flowering plants in your garden all season long.